With our bellies full of chicken livers and smoked meat, The Astronomer, my sis-in-law Sonia, and I strolled over to Dominique Ansel Bakery for one final sugar rush. 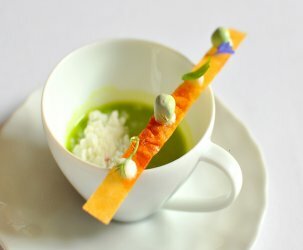 Chef Dominique Ansel opened his eponymous bakery at the end of last year after toiling at Daniel for six years and at Fauchon in Paris before that. Even though the shop has been open for only a short while, there’s already buzz that it’s the best bakery in town. Hype in these here parts can be intense. I had my sights set on the “Perfect Little Egg Sandwich” ($5) this afternoon, but unfortunately it is only available before noon on weekdays. 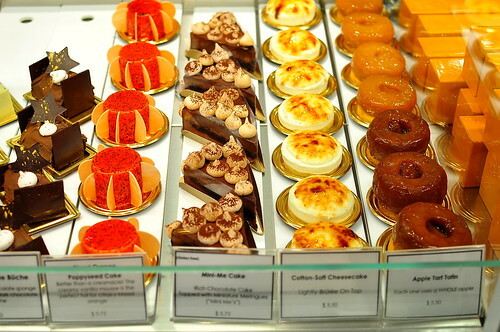 I quickly switched gears and perused the pristine pastries on hand. In addition to croissants, ice creams, sorbets, and sandwiches, the bakery offers an array of jaw-droppingly beautiful tarts and cakes. Each one was assembled with precision and was far too fetching to eat, really. 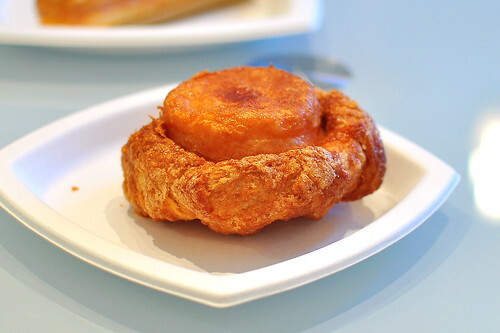 I settled on the DKA ($5.25), “Dominique’s Kouign Amann.” The Kouign-amann, which is a Breton pastry, was comprised of crisp, flaky, and buttery layers sweetened with just a touch of caramelized sugar. The best part was the heart of the pastry, which was tender and rich as all get out. 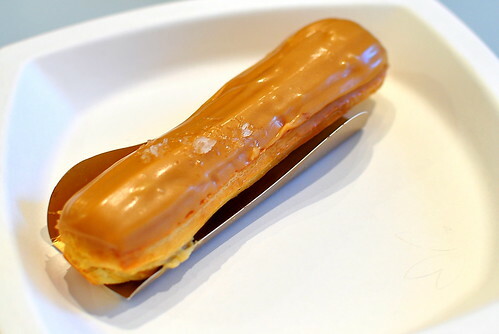 I also couldn’t resist the charms of the Salted Caramel Éclair ($5.50). The choux pastry was delicate and light, while the caramel-tinged pastry cream was cool and just sweet enough. 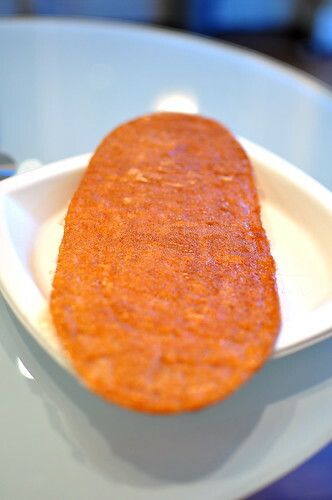 The best bites included some of the flaky salt sprinkled atop the eclair. 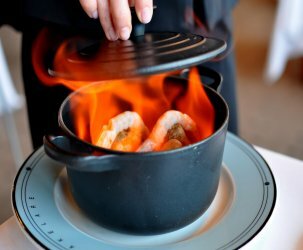 The Astronomer selected an arlette ($3), a cookie originally from the south of France that was described as a “cinnamon-flavored palmier” on the menu. Crisp, thin, and redolent of warm spices, the arlette was just The Astronomer’s speed. He’s got a penchant for mild, cinnamon-laced sweets and this one hit the mark. 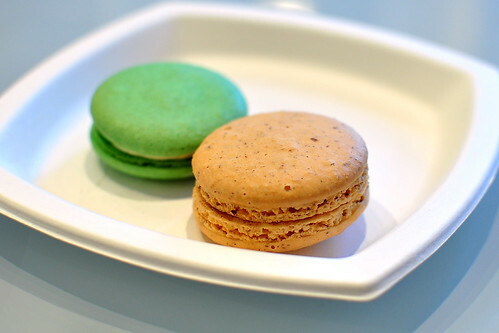 Sonia snagged two macarons ($2.50), one hazelnut and the other pistachio. My sis-in-law is something of a macaron connoisseur, and the ones here were only average for her. I stole a bite of each and agreed with her assessment. These were good, but not spectacular. 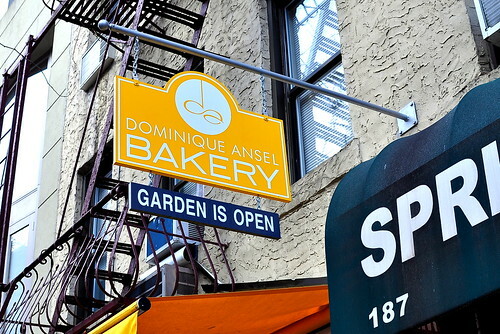 On my next visit to Dominique Ansel Bakery, I plan on making a serious dent in the cakes and tarts. 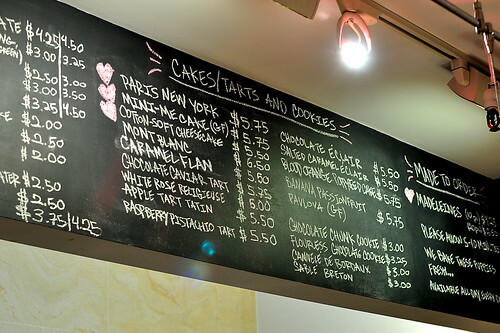 I’ll likely start with the “Chocolate Caviar Tart” (Chocolate caviar on top of a coffee caramel mousse), move on to the “Paris-New York” (pâte à choux dough filled with caramel, peanut, and chocolate), and finish with the “Banana Passion Fruit Pavlova.” Afterward, I’ll go shopping in Soho to work off all the calories. Oh, it will be glorious.